Four Hundred and Eightysixth Asic- My New Favourite Tree | From a teacher's point of view, some is old and some is new! I wrote about the maples in Sweden and how I used to collect the colourful leaves in the autumn. I have always loved trees and since I live in a part of Sweden where forests are a part of the nice scenery, I always find a walk in the forest very soothing if I need to relax or find new energy. I walked along nice streets in Pitman, where mainly tall maples and oaks give gardens their share of fallen leaves. 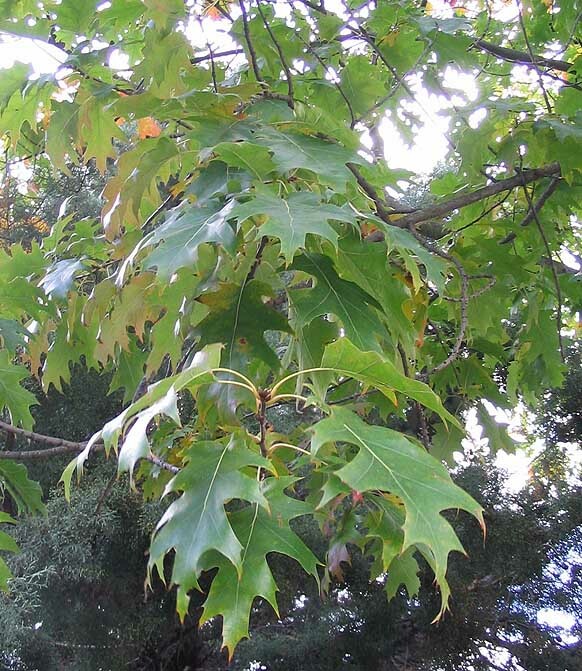 One kind of tree was unfamiliar to me, but I could tell from what it looked like that it had to be a maple or an oak, so I picked up a leaf and brought it with me to #Pitman Middle School, where I asked everyone I met: ”Is this a maple or an oak?”. Most people said: ”I don’t know but I think it is…” and then two people very quickly said: ”It’s an oak, no doubt!” Now I KNOW it is an oak, since I have done what most people do nowadays… I googled it… It turned out to be a red oak. Detta inlägg postades i #USA, Åserier, Åsics ;), Barndomsminnen, Childhood memories, Experiences, In English, Language learning, Tankar, Thoughts, Trips and travelling, Upplevelser och märktes #asaole, #asaolenius, #autumn leaves, #barndomsminne, #blogginlägg, #fall season, #genvägar är senvägar, #höstfärger, #lönnlöv, #maple, #Pitman School Visit, #red oak, #Sjuttioförsta åseriet, #USA.